One of the more absurd spectacles in the press's coverage of the economy is the attack on the Trump White House's long-term economic growth assumptions in this week's budget release. The same reporters, pundits and outlets now ridiculing the Trump administration's belief that the economy can consistently grow by 3 percent each year beginning four years from now were stone silent when the Obama administration, whose alums have joined the current negative chorus, used far higher growth assumptions — and miserably failed to achieve them. Jason Furman, Obama's chairman of the White House Council of Economic Advisers during his administration's final four years, in the Wall Street Journal on Tuesday — "President Trump has outdone Ronald Reagan in at least one respect: unrealistically rosy forecasts for economic growth ... Now Mr. Trump is leading the economy down a primrose path that is even more unrealistic." Alan Krueger, who preceded Furman for roughly two years, as seen in a discussion earlier this week on CNBC, said that "this budget strikes me as extremely rosy." Krueger, while acknowledging the Obama administration missed its growth targets, never said what they were, but also claimed that Team Obama was "projecting unemployment to be higher than it actually was." I guess he thinks that all those graphs, like this one and this one demonstrating otherwise, have disappeared. They haven't. Greg Ip at the Wall Street Journal — "Donald Trump’s first budget ... sets a worthy objective of sustained 3% economic growth, but offers no rigorous plan to back it up. To listen to budget director Mick Mulvaney, the main thing holding the U.S. economy back is a bad attitude." Well, given that President Obama insisted that "jobs aren't coming back" in various blue collar-dominated industries while his administration obstructed progress in the energy and other economic sectors, there certainly was "a bad attitude" in the White House until January 20. The complaint about the current lack of a "rigorous plan" may be true, but it's ridiculous to pretend that removing regulatory barriers to progress instead of imposing more of them won't make a difference long-term. South Carolina Congressman Mark Sanford, an alleged Republican, is quoted in a Wednesday CNBC writeup saying that "This budget presumes a Goldilocks economy ... It assumes that the stars perfectly align with regard to economic drivers." Leading the pundit pile-on, the Washington Post's Dana Milbank wrote on Thursday that "the Trump administration assumes 3 percent growth for the next 10 years, a level not seen in decades. Magical assumptions make budgets magically balance." Milbank either hasn't read the Trump budget document, or he chose to deliberately mislead readers. The Trump budget assumes sub-3.0 percent growth from 2018 through 2020, and 3.0 percent after that. At the Associated Press, economics reporter Josh Boak curtly claimed that "Most economists and budget experts dismiss that (3 percent growth) promise as fancifully unrealistic." 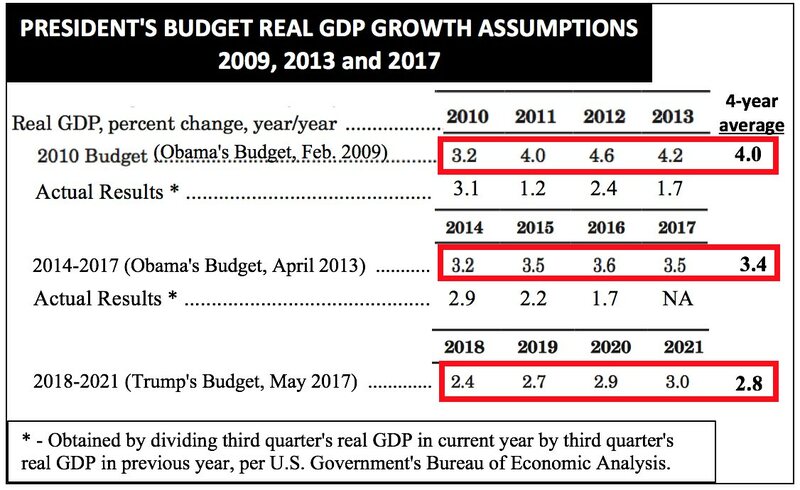 Meanwhile, the pundit class is pretending not to remember any of this as it attacks the Trump administration's more conservative growth assumptions. The primary and perhaps valid reason the naysayers cite when they claim 3.0 percent annual growth is unrealistic relates to demographic trends which may prevent the workforce from sufficiently growing. But what that really explains is why 4.0 percent may be an unrealistic target. As seen in a table here, the economy during the Reagan and Bush 41 administrations grew by 4.3 percent per year for seven years. For seven years during the Clinton administration (thanks largely to welfare reform and balanced budget efforts for which that era's Newt Gingrich-led GOP Congresses deserve the lion's share of the credit), economic growth averaged 3.9 percent. Even during the Bush 43 administration, economic growth averaged 3.9 percent for 13 quarters. If the workforce grows by 1 percentage point per year less than it did during those eras, targeting 3 percent instead of 4 percent may make sense. It doesn't make targeting 3 percent unrealistic. Critics who claim that it is unrealistic and wish to be consistent must acknowledge that the Obama administration was engaging in wildly irresponsible unrealism four and eight years ago. The demographic trends currently cited to bash the Trump budget's assumptions were present in nearly full force during the Obama era. If this (3 percent annual growth) is a rosy (long-term) scenario, Democrats haven’t begun to imagine the budget cuts that will come (if not achieved). There is no way the U.S. can afford its entitlement commitments without 3% growth, much less balance the budget.